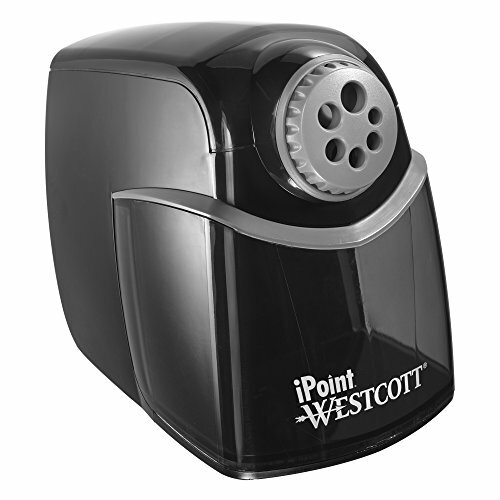 Westcott pencil sharpeners are necessary for any school or offïce that uses pencils regularly. A good pencil sharpener will keep your writing instrument sharp and ready to use for a long time. Westcott offers a wide variety of pencil sharpeners to meet your every need. This electric pencil sharpener quickly sharpens the tip of your pencil. The sharpener does all the work, and the container neatly captures all the shavings until its time to empty it. The heavy duty construction ensures long lasting performance. From the Manufacturer: Westcott develops home and office products unmatched in style, design and performance. We continue to deliver results that are both inspirational and functional, earning the title of "The World's Favorite Scissors" year after year.